What Are The Odds Of An All Merle Litter? My blue merle Aussie just had a solid merle litter! 4 blue merles and 3 red merles to be exact! She was bred to my black tri male. 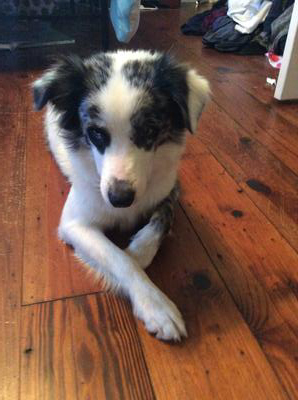 How common is it for an aussie to give birth to a litter of all merles? 3 red merles and 4 blue merles to be exact! My blue merle Lucy was bred to my male black tri and lo and behold, all merles! I just knew she would have at least one tri colored pup but we were so surprised! Comments for What Are The Odds Of An All Merle Litter? They obviously both had a merle gene in them so you got 2 merle genes together for each puppy. 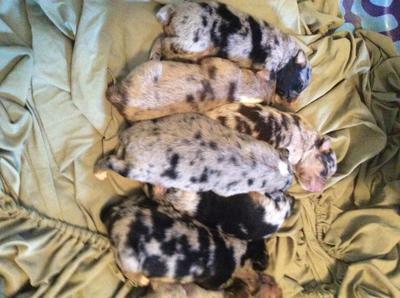 As for having the red merle puppies, both parents had to have had a red gene in them as well. I believe she said what are the odds. I didn’t see any questions regarding how it was possible genetically. Genetically she could have had one blue and red and the rest tri and the genetics would still be the same as having a litter of merle. This only happens with merle to merle breeding. The blk tri is a phantom merle. the odds of a all merle litter is rare, I have had it happen to me and yes I know the bloodlines and they are a red tri male with a blue tri female and I have 7 all merle in color.. the idiot who said it had to be merle to merle to get this color well put it thisaway they are clueless..
She literally said she bred a blue merle to a tri, how hard is it to read before assuming she bred double merles? And a black mask isnt something to worry about. You're thinking of Lethal White and none of them have that.